The latest Windows Phone 7 update caused nothing but trouble for Microsoft – it didn't bring any major innovations, but it succeeded in bricking some Samsung phones. A day has passed, and Redmond has pulled the update for handsets by Samsung as it looks into the issue. “In response to this emerging issue, we have temporarily taken down the latest software update for Samsung phones in order to correct the issue and as soon as possible will redistribute the update,” Redmond commented in response to WinRumors. The irony of it all was that the update was a very minor one, supposed to fix the updating process ahead of a bigger update expected in March, which is to bring the much anticipated copy-paste and CDMA support features. 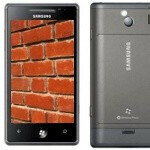 Samsung Omnia 7 owners were affected the most, with many reporting that their phone remained “bricked” after the update. Not all users were affected, but whatever the number of bricked devices is, this definitely looks like a valid reason for pulling the update. Reports showed that after step six of the process, the phones switched off for a reboot only to get stuck afterwards. Hopefully Microsoft can come up with a solution sooner rather than later. Let us know if the issue affected you! In general, hasn't Samsung phones had trouble with updates for Droid OS as well? I have read several upgrades for the Galaxy series have frozen handsets or dumped data. Particularly on the Epic. This one may be more on Samsung then Wiindows, even though Microsoft is left looking bad. I would have to agree with you snow this looks less like Microsoft's fault and more of a Samsung problem being it works on every other WP7 out there. I don't even know why Samsung makes high end phones they always seem to fail at it. They make good low to mid range phones though. The only way to end this windows andriod war is for samsung and sony to give a dual os boot mirroring contacts and sms.